CONSIDER: MANY OF THE PHOTOGRAPHIC EFFECTS MOST DEARLY PRIZED by today’s edgier shooters actually have their roots in the shortcomings inherent in the techniques of the medium’s first years. That is, the artifacts produced in early photos (the blotches, streaks and smears that visually betrayed the limits of a particular era’s technology, from bad film emulsions to flawed lenses) are being sought out and deliberately inserted back into contemporary images, almost as if they confer some kind of authenticity on the final results. We came this far only to pretend that we haven’t moved at all. There’s nothing to be gained by trying to figure out why we struggle to remove certain glitches from pictures in one age only to revere them in another. Fact is that many of us occasionally crave that “old timey” look, and so the very thing that once annoyed us as a defect becomes, later on, desired as an effect. Halation, once an artifact of film processes, now can be achieved with special lenses. Halation, or the soft, glowing aura around bright areas in an image (imagine the diffused appearance of street lamps in a thick fog) was originally an unwanted look that happened when light would go through sensitized film, then reflect off a surface behind it (say the inside back of the camera body) and bounce back through the film a second time. This so-called “light scatter” would appear as an ethereal haze around the brighter objects in the picture, almost like a halo around the head of a saint. Halo—Halation. Annoying defect if you don’t want it. Subtly dreamy effect if you do. The “accidental” part of halation was addressed ages ago by adding inhibiting agents to film and matte surfaces to camera bodies. The “intentional”part has been added back in artificially, either with the use of layers in Photoshop, or with Lensbabys or other “art” lenses intentionally designed to render the effect (as seen in the above image). This kind of reverse-engineering, the process of “putting the scratches back into the record”, of restoring the very things we once rejected, is increasingly common in the post-digital era, as we still long for analog experiences, even, it seems, the imperfect ones. This entry was posted on January 15, 2018 by Michael Perkins. 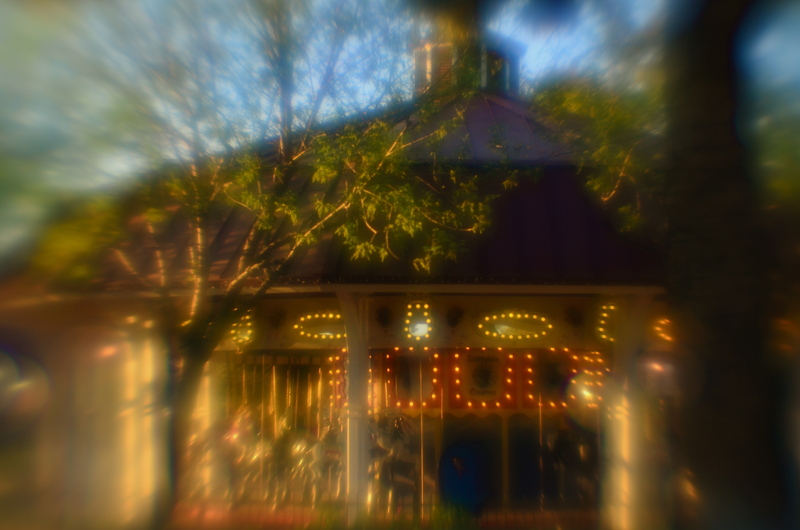 It was filed under Effects, Experimentation, Lenses and was tagged with Lensbaby, Photoshop.